If you thought I was going to leave the Kanye West “Bible” subject alone, then you might also believe Tupac is at my house. I have no idea why, over the years, I have this reflexive need to mention Kanye West. But I do. I’ve mentioned him in ways that were in many levels—prescient—meaning “having my thumb on the pulse of a trend so acute, that you might think I’m Nostradamus.” I’ve satirized him before on a now-mothballed blog on which I wrote under a different name. I’m not going to link to any remaining remnants of those days, because I’ve had moments in my life where I carried far more of an acerbic edge than I have set out to have on this blog—at this time—in the true legacy I’d like to hash out for myself as a writer. And besides, I deserved at least half of the hate mail I received. Maybe even most of it. Anyway. 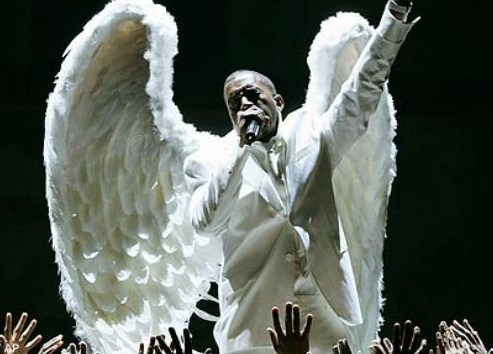 Speaking of overinflated, egotistical flotsam and jetsam from the hagiographic regatta wrecks*, I’d like to talk about Kanye West, who, not content to compare himself to Walt Disney, hector Taylor Swift, or requires paraplegics to stand up at his concerts, has now decided that he is now a deity. And on and on it goes. Prognosticator after Prophet after seer after peeper after mutterer—all trying to psychoanalyze Mr. West. Some of them even imply he is some kind of incarnation—a supernatural hybrid of god and man. And apparently, this is the opinion of a trio of neo-entrepreneurs that thought entering the Book of Genesis into a word processor, changing the “God” “Jehovah” and “Elohim” macros to “Kanye” and hitting the PRINT button would be a great idea. Now, I will admit, when I first heard of it, I figured the guy that names his child after an ambivalent compass setting was behind the whole thing. But I was wrong. Apparently, Kanye moved upon three brothers in a dream, and they obeyed the still, small voice of ID. Now, the thought behind the marketing scheme is supposedly one of those abstract, artistic “excuses.” By that I mean the artist involved gets loads of attention and money for their project, all in the name of “shining the light on a much weightier subject.” Robert Mapplethorpe got away with this stupidity in broad daylight. So did Andre Serrano. And, true to this form, this triumvirate of opportunists claim they are simply making a statement about the iconography of celebrity; that no matter what voids the secularists try to create by expurgating religious expression from public discourse, that mankind will automatically find another subset—or cultural fly-by-night, and elevate it to a kind of rabbinical priesthood. 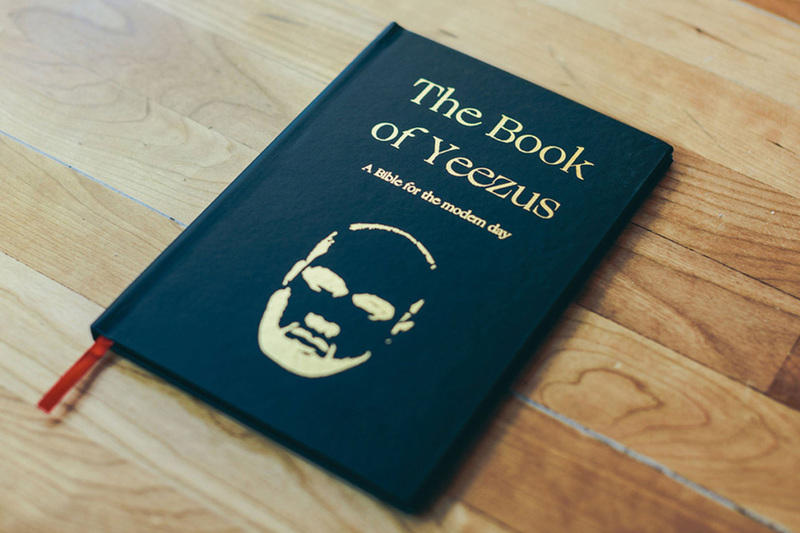 Book of Yeezus is simply an exposition. It’s adding an original twist to something ancient and important in order to capture new meaning. We are trying to cast our spotlight towards the way cultural icons have come to be the contemporary spiritual figures in our information culture. And as it would happen, Mr. West is rumored to have objections to the portrayal itself—and, if true, I believe it will be safe to assume it is not because he feels the simile, types and theophanies are over the top and sacrilegious, but, more likely because publishers have transgressed Mr. Wests prohibitions against using his graven image and name—a passage from the probably-to-be-sequeled Book of Exodus—which I will pre-emptively title North West out of Egypt. God chose me, He made a path for me. I am God’s vessel, but my greatest pain in life is that I will never be able to see myself perform live. Come to think of it, that quote comes from a different book. * Okay, look. I get it. I get a ton of complaints from my friends that they don’t read my blog because of this kind of written tomfoolery. I’m sorry. This is who I am. I hear these things in my head in real time, and they just spill out like that. I simply can’t dial down who I am, and I know an audience for whatever this is I do is out there. Please, hang in there. It gets easier. This entry was posted in Blogging, Entertainment, Writing and tagged Bible, book, entertainment, glamour, kanye, kardashian, of, Yeezus. Bookmark the permalink.